Watching your collection of DVDs at home has made the journey from the shelf to your computer's hard drive countless time. But there is always sometime you want to enjoy your DVD movies outside with portable devices like iPad, the coolest entertainment console ever created. Fortunately, DVD to iPad converter software makes it possible for you to watch DVD films on iPad wherever you go. As to cinephiles, this program is not strange since various DVD to iPad converters are available in the market. But as far as the best DVD ripper for iPad is concerned, some applications finally win the ultimate triumph while some are weeded out because of inability to stand the test of time. Here we specifically listed top three best DVD to iPad converters for Mac, so that you can make up your mind which is most suitable for you: MacX DVD Ripper Pro, Handbrake or iSkySoft DVD to iPad Converter. 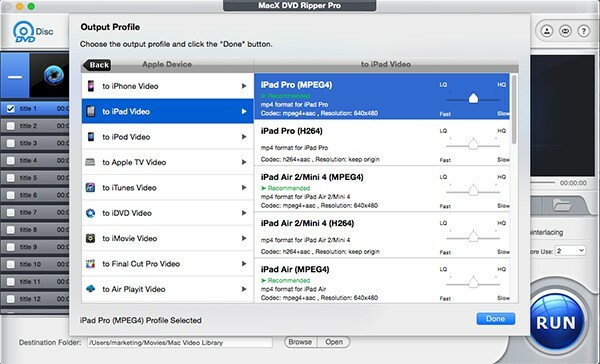 Though not so famous as Handbrake, MacX DVD Ripper Pro wins a good deal of thumbs up from Mac consumers and ranks first as it serves as the best DVD ripper for iPad beyond compare, with optimized preset especially designed for any generations of iPad, including iPad 2/3/4, iPad Mini, iPad Mini with Retina, iPad Air 2. This iPad DVD ripper for Mac entitles you to easily access to any copy protected DVDs, no matter Disney copy protection, CSS encryption or Sony ARccOS protection, so that you can feel free to rip copy protected DVD onto Mac (macOS Mojave incl.) without even a hiccup. This top notch DVD to iPad converter is also bundled with a flood of features, allowing you to take movie off DVD and convert DVD to MP4, MOV, FLV, AVI, MP3, iTunes etc so that you can sync the DVD into your iPhone, iPad, iPod, make your DVD stylish with your iMovie, upload the customized DVD to YouTube, and watch DVD on Samsung, Android, PSP, Xbox, etc. Another noteworthy content you shall never miss from the best DVD ripper for iPad is that DVD ripping speed and video quality are those you'll never feel disappointed at. You can finish DVD to iPad conversion onto your Mac in a flash and will never suffer from any video loss or chopping of video or audio when playing the converted DVD movie on your iPad. What's more, the editing feature gets your DVD trimmed, cropped and merged as you want. And intuitive interface makes any DVD ripping dead easy even you are a novice. Now let's talk about how to use Handbrake to rip DVD for iPad. Indeed, Handbrake gains a great reputation for its open source and ease of use and undoubtedly wins the silver award in terms of the most-wanted program to convert and rip DVD to iPad. Of course, Handbrake empowers you to rip DVD to MP4 that is compatible with iPad, provided you only have common DVDs. When it comes to encrypted DVDs, Handbrake may be at a loss, only throwing you into dilemma. At the same time, the limitation of only supporting MP4 and MKV formats makes Handbrake powerless in case you want to upload your DVD video to YouTube for many online sites only recognize videos in FLV and AVI formats. Worse still, new Mac OS X, though bringing everything new to us, also takes many programs like Handbrake in an awkward situation for the bad compatibility. That is to say, there is a big possibility that new DVD movies are unavailable to rip with Handbrake. Anyway, let's get to the point. For DVD to iPad ripper, Handbrake is still the top choice. But for some other reasons, think twice before you do that. Among the top 3 best DVD ripper for iPad, iSkySoft DVD to iPad Converter is still worthy of our attention. As its name suggests, this program enables to rip and convert DVD to iPad friendly format (H.264, MP4, M4V) under Mac computer, regardless of copy protection. As a top DVD to iPad converter for Mac, I know merely DVD to iPad conversion feature cannot satisfy your endless needs. This iPad DVD ripper for Mac also furnishes editing function that can make your converted video stylish. However, to my regret, too many bells and whistles offered on this Mac DVD ripper for iPad do not produce any good result at all, only translating into chopping and blurry videos and images. What's worse, invariably clumsy interface even makes people confused. In view of the above shortages, I give this program the bronze award in ranking the best DVD ripper for iPad. Finally no matter which way you'd like to rip DVD to iPad, there is one more step tp watch your DVD movies on mobiles - transferring videos from Mac to iPad iPad. And MacX MediaTrans, a professional iOS transfer would do you a favor on this purpose.